What Are The White Spots On My Pickles? 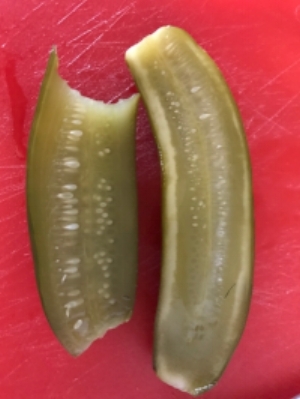 Can you tell me why this littles dots on my Pickles is normal? (Pictures are attached) They dont have that before.. The pickles was made the last summer so already 7 months in the fridge. Also, I find that often, my fermented vegetables are soft. Not crispy (pickles, greens beans, radish...) why ? I always put a little bit of black tea in the final jar but help to keep their crispiness. Oh dear, those do not look well. I believe this is some kind of fungus. This could happen if even one of the tops of the pickles was peeking out of the brine. That little bit of exposure acts as a vector. As far as soft ferments, more often than not that is because there is not enough salt in the brine. One of salt’s functions is to harden the pectin in the cell walls and this is what keeps things crispy. Tannins help but you need more salt to begin with. Cucumbers are especially needy in this regard. Of all the things I ferment cucumbers get the highest salt ratio. They just want to soften otherwise. You want to you a 5% brine. Wondering what’s up with the color difference on my lacto ferment pickles. Same batch, one has a light green band around the outside, and the other is fully dark green all the way to the skin. Thanks for reaching out about the cucumbers. I am sorry but we have been traveling for the last 2 weeks and I don’t know if Christopher got back to you. I apologize for the late reply. The discoloring you see is just the way the fermentation works. The white parts are not fully fermented, called half-sours to some. This is okay as it will continue to ferment in the fridge. How it works is that when you sink the cucumber into salt water the saline of the salt water and the base water in the pickle exchange in an osmosis process because the water is looking to balance itself—meanwhile the lactobacillus are acidifying the whole affair. This is why you see variation in the coloring—different speeds of that exchange. I hope that helps and you enjoy your pickles. Dark grey sediment in my ferments? I found your site through a Google search and can't thank you enough for providing the help section! This is our first attempt at fermented vegetables. They have been bubbling, the lids swelled a little and became hard, and they have been seeping (all of which I'm guessing is normal). What wasn't mentioned in the recipe is that the brine developed these grey, sediment-like particles that began floating throughout each jar but mostly settled to the bottoms (looks darker in person than in picture). Each of the 9 jars also developed a dark grey/black ring around the bottom. 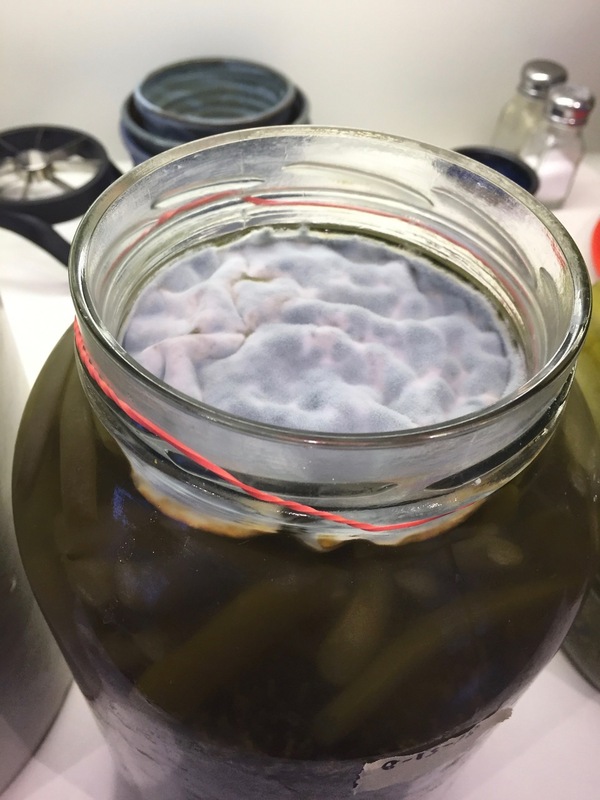 Is this a normal/safe ferment? When I opened one this morning (day 8) it was hard to open and fizzed, bubbled and sizzled as if it's been fermenting fine and there does not appear to be any discoloration on the cabbage leaves I used to hold the veggies under water. Thank you so much in advance for your time! We are glad to hear that our site is helpful. You are right all that “action” is quite normal. The sediment is also quite normal—in fact when I see cloudy brine and sediment I know that the process is working well. The black bits of sediment are not normal in and of themselves but I am guessing that they are from a grey Celtic style salt or that they are a spice or herb that your recipe may have called for that has also settled along with the sediment. If you don’t feel that is the case, let me know what was in the recipe and we can look a bit further into it. As far as the cabbage leaf on top of your 8 day ferment it looks normal to me. I don’t see anything in the photo that concerns me, it does as well as the other photos, look like they are not fully fermented yet. In cooler temperatures 8 days can still be a young ferment — in hot temperatures 8 days can be over fermented. So it depends. If it is ready it should be smelling nice and acidic —pickle-y :) If it does then go ahead and reach under that leaf and taste it. If it is tasty you can put it in the fridge if it isn’t sour enough then close everything up and let it go a few more days. Remember if a ferment is bad it will let you know—the smell alone will say don’t put me in your mouth. I am making my first batch of fermented pickles. The recipe I used had me place a ziplock bag on the top to weigh down the brine. It now is covered in mold. If I remove the bag carefully will the pickles below still be okay?! The bag is doing its job and keeping the mold off of your ferment. Everything below the brine is fine and I don’t see where the mold has even gotten past the bag. Just remove the mold carefully, then the bag carefully and you should be golden. Are my fermented pickles ok? I bought a copy of your book last month and successfully preserved a bunch of farm fresh vegetables using your fermenting techniques. However, I am having some doubts about my pickling cucumber ferment. I followed the NY Deli-style pickle recipe. After 5 days I noticed Kahm yeast and removed it. Before refrigerating I noticed some slime so I added more salt to the brine. Upon doing so, I noticed white clumps formed the minute I added a bit of grey sea salt. The water itself looks cloudy and some of the pickles seem to want to float. The white clumps have since settled to the bottom of the jar. The brine itself smells great but before tossing the batch and deeming them unsafe to eat I thought I would get a second set of eyes to look at my jars of pickles. Please see the attached pictures. Any feedback would be greatly appreciated. Thank you for the pictures, they really help. All veggies want to float in the brine and it looks from the pictures like maybe they did some floating in the jar. If any of them did slip out from the pack and float to the top that would be a conduit for develop enzymatic or yeast infections. We are guessing you may have one or both on this batch. Cloudiness is normal but the white chunk is baffling to us. Our recommendation honestly Tina is to compost this batch and try again. If you are up for that really pack them in tight and under that shoulder of the jar - they should be in there tight enough that none can float to the top. It also helps to find a tannin rich leaf—grape, oak, horseradish to tuck over the top to keep things under the brine and crispy. We hope you still have cukes and that you have a good second batch. Question: I just started fermenting. First I made sauerkraut - Delicious! Now I just made your asparagus & caulikraut recipes. The caulikraut looks great but the asparagus brine turned brown after 1 day. Is this okay??? Thanks for your help. Answer: The brine in this picture looks fine. It is at the beginning of the process and often at this stage the brine will take on some of the colors from the vegetables or spices. This is a normal color for asparagus. You will continue to see changes in the color of the asparagus as well as the brine.